One of his interests was railways, and he had a grand vision of building a series of small railways to run between the Great Western Railway’s Uxbridge branch and the railways of East Anglia. Two of these materialised under his Chairmanship, the Watford and Rickmansworth Railway and the Hatfield and St Albans Railway. Between these two was the London & North Western Railway’s branch between Watford and St Albans. Two other companies were set up under his Chairmanship, the Uxbridge and Rickmansworth Railway and the Rickmansworth, Amersham and Chesham Railway, both of which encountered financial difficulties, and neither of which was built. The Minute Book records that he was one of four who attended the first Board meeting, on Thursday 11th December 1862. The Minute book also records that he was elected Chairman of the company at the third Board meeting, on 22nd April 1863. Under his Chairmanship the money to build the railway was raised, the contractor appointed, and the line built; it was then operated by the Great Northern Railway, as agreed in the original plan. His last Board meeting was that of 14th February 1883, although there were a few such meetings after that. His last meetings were the two Extraordinary General Meetings of the proprietors, of 29th March 1883. Following financial woes from the beginning, the railway was eventually taken over, by the Great Northern Railway, on 1st November 1883. Born on 24th April 1801, as Robert Grosvenor, to Robert Grosvenor, first Marquis of Westminster, and Eleanora, in Westminster. Educated at Westminster School and Christ Church, Oxford (B.A. 1821). Elected to the House of Commons as a Whig member for Shaftesbury in 1822 (until 1826). Elected to the House of Commons as a Whig member for Chester in 1826 (until 1847). 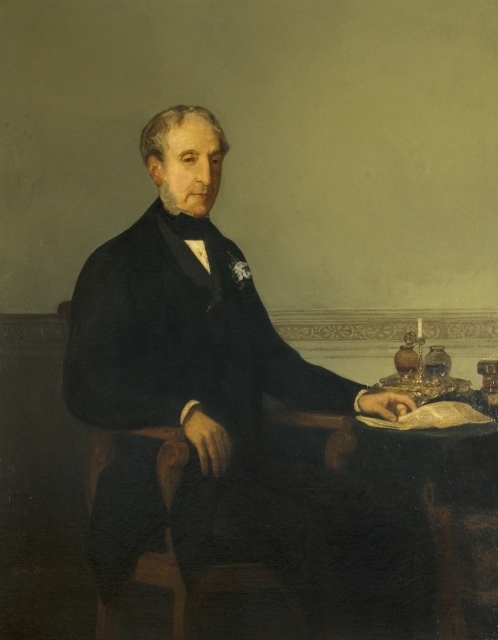 Appointed to the Privy Council in 1830, a position he held until his death in 1893. Became Comptroller of the Household on 23rd November 1830 (until 9th July 1834). Married the Honourable Charlotte Arbuthnot Wellesley on17th May 1831, at St George’s, Hanover Square, London. Became Lord Robert Grosvenor on 13th July 1831. Became Groom of the Stole to the Prince Consort in 1840 (until 1841). Became Treasurer of the Household on 3rd August 1846 (until 23rd July 1847). Elected to the House of Commons as a Whig member for Middlesex in 1847 (until 1857). Gave the site and money for building Holy Trinity Church, Northwood (opened 1854). Became the first Baron Ebury, of Ebury Manor, Middlesex, on 12th September 1857 (on Lord Palmerston’s recommendation). Wife Charlotte died on21st November 1891, at 35 Park Street, Middlesex: buried in same grave. Died on Friday 17th November 1893 (The Times) or 18th (Probate record) or 19th (www.findagrave.com), at his London residence, 35 Park Street, Grosvenor, Middlesex. Buried at 2.30pm on 22nd Nov ember, in Holy Trinity Churchyard, Northwood, near Rickmansworth (near the south door). Probate granted on 1st March 1894: effects ££147,048 7s. The London Homeopathic Hospital (1849) (Chairman and President). The Watford and Rickmansworth Railway (1860) (Chairman). The Uxbridge and Rickmansworth Railway (never built) (Chairman). The Rickmansworth, Amersham and Chesham Railway (never built) (Chairman). The Hatfield and St Albans Railway (1862) (Chairman). Moor Park House, Rickmansworth, Hertfordshire. 35 Park Street, Grosvenor Square, Middlesex. He, his wife, 2 daughters and 1 son are at Parliament Street, Westminster, in the 1841 census. He, his wife, 2 daughters, 2 sons and several others are at 107 Park Street, Westminster, in the 1851 census. He, his wife, 2 daughters, 5 sons and several others are at Moor Park House, Rickmansworth in the 1861 census. His wife, 2 daughters and several others are at 35 Park Street in the 1871 census. He, his wife, 2 daughters and several others are at 35 Park Street in the 1881 census. He, his wife, 2 daughters and 1 daughter-in-law are at 35 Park Street in the 1891 census. The Hatfield & St Albans Railway Company Minute Book. Which man in the 1867 photo of St Albans station is lord Edbury?